Ever wonder if Tesla met Lovecraft what the result would be? Would the two hit it off instantly? Would they find disagreement in their differing views on life? Would they team up to save the life of Amelia Earhart? 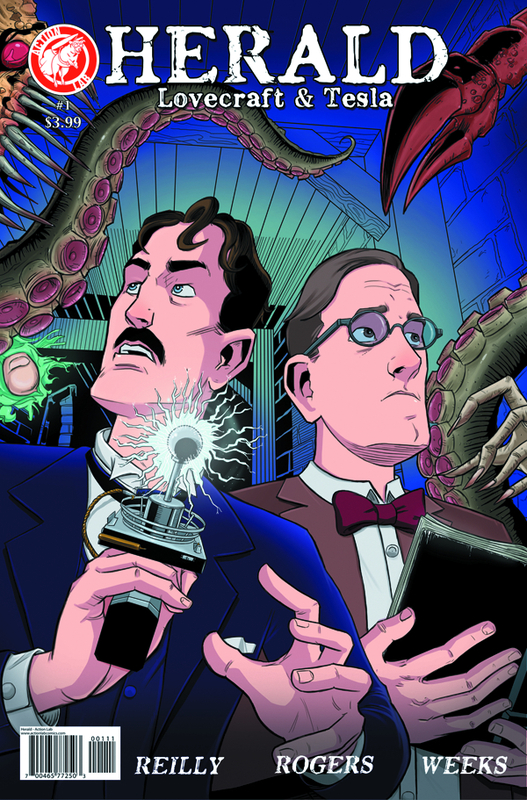 Only Herald Lovecraft and Tesla #1 from Action Lab Entertainment has the answer! The issue is written by John Reilly, penciled by Tom Rogers and inked/colored/lettered by Dexter Weeks. When Nikola Tesla's fiancée, Amelia Earhart, steals a dangerous prototype engine for a trans-Atlantic flight, Tesla seeks out the interdimensional expertise of H.P. Lovecraft to save her. Lovecraft, however, has problems of his own as he investigates the identity of Cthulhu's Herald. One's problems surely confound the others, but it all makes for an extremely fascinating story. Here's the thing about historical mash-ups: just because there are other famous individuals in existence alongside other famous individuals, they all don't have to be included in a story. Reilly manages to work in Tesla, Lovecraft, Amelia Earhart, Albert Einstein, Harry Houdini and even a reference to Thomas Edison. It's all done in a way that feels a little convoluted at times, as it's rather difficult to discern who the main protagonists really are until the end of the issue when things are made a bit clearer. Despite the multitude of famous characters, the book does have a solid flow to it and there's likely going to be comparisons to Alan Moore's League of Extraordinary Gentlemen. Earhart's characterization is part independent woman/part damsel in distress, so it remains to be seen how she ends up characterized in the end. Rogers' pencils carry the story solidly enough, despite some inconsistencies here and there. For instance, some of the perspectives look a little uneven, which disrupt the narrative flow of the story. Characters strongly resemble their historical counterparts, so it's very easy to keep up with who's who when it's all said and done. The empty gutters give the book something of an incomplete feel at times and also allow the somewhat sparsely populated backgrounds to stand out a bit more. Inks and colors by Weeks add a very vibrant feel to the proceedings, almost so much that some of the characters feel even more out of place in history. Herald Lovecraft and Tesla #1 is a very ambitious mash-up that does offer a promising duo in Lovecraft and Tesla. Their rapport is very much in line with their reported personalities, even if the first issue is very light on any actual interactions between the two of them. The story by Reilly sets up a lot of storylines in the first issue, leaving very little time in the remaining two issues to see them all through to what is hopefully a satisfying conclusion. Rogers' pencils are sufficient for conveying the visual aspects, further buoyed by Weeks' bold color and ink choices. Herald Lovecraft and Tesla #1 offers a promising concept, although it remains to be seen whether or not it will pay off in the end. Herald Lovecraft and Tesla #1 is in stores now.